It may be a bye week for the BC Lions, but this Saturday, August 11th there is a great football event happening at Sports & Stuff in Chilliwack. 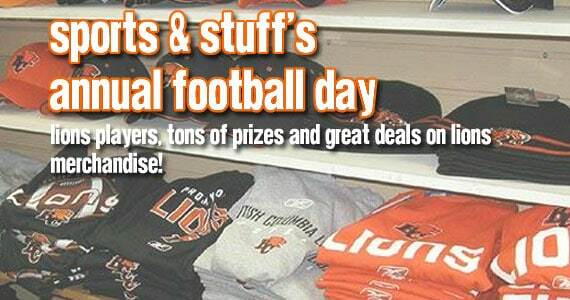 If you’re a big Lions fan it may well be worth your while to take a drive out to the Fraser Valley and check out the store’s annual Football Day. Sports & Stuff has the biggest selection of BC Lions and CFL merchandise that I personally have ever seen in a sports store and I always stop in to find that shirt you’ve never seen, or that beer mug you’ve been longing for. BC Lions players Arland Bruce, Khalif Mitchell and Tim Brown will be on hand to sign autographs and have photos taken and the store has rounded up great prizes, including a ton of Lions merchandise a trip to Las Vegas as well as a chance to see the BC Lions play the Edmonton Eskimos on September 22nd in Edmonton, flight, hotel and tickets included. The event runs from 11:00am to 3:00pm with the players arriving at 1:00pm. There will be early bird prizes drawn at 12:45. Grand Prize draws will go at 3:15 and you must be present to win. You’ll receive one entry for every $10.00 spent, and you’ll also get a chance to spin the wheel for a discount of between 10-25% off your purchases. Here is a more complete list of the prizes up for grabs! Prize List for Sports & Stuff Football Day, August 11th from 11:00am to 3:00pm. A trip to Edmonton to see the Lions play the Eskimos. (Includes tickets, airfare, accommodations and airport transportation). Autographed Travis Lulay jersey and helmet. Autographed Travis Lulay Grey Cup championship hat. Chilliwack Chiefs tickets and overnight stay at the Comfort Inn in Chilliwack. See you there! Let Rick and Wendy know that BCLionsDen.ca sent you!